For a kid who cried in Kungfu Panda (when he realises the duck is not his father), I’ve become an intensely unemotional human with the longest tear drought a 23-year-old single freelance woman in fashion has ever seen. I credit this to a cocktail of exhaustion, constant air travel-related dehydration, and my militaristic emotive separation from working with crazy clients to maintain some shred of sanity, which has worked wonders for my productivity, and capacity to spend six weeks living out of a suitcase. For my soul, not so much. I generally apply the same reasoning to architectural icons and monumental tourist attractions. If there is a way around moshing, I will take it. Place du Trocadéro for that shot of the Eiffel Tower with mini-Eiffel towers being jangled in your face, not so much. But Champ du Mars before sunrise? Sign me up. No pain no gain. However, if the experience, regardless of its immediate human headcount, would surely bring me to tears (Top of the Rock at sunset, say, or playing in the San Marco Basilica), I will brave any heaving crowd to behold some glorious piece of art or history or culture or religious iconography. Fontana di Trevi is one of these. On my first visit to Rome, shooting this self-portrait story for Fendi ahead of tonight’s show in celebration of the house’s 90 years of being badass, it was another of my rare tears, standing on the glass runway constructed just over the waterline, staring up at the most intricate piece of 16th Century architecture the city has to offer, it definitely drew those rare tears – through the dripping sweat of midday heatstroke, and my Roman curls, in front of throngs of confused onlookers. Even so, my producer and I needed it out of our systems so as not to choke and bawl while asking all the hard-hitting questions Fontana-side this evening for the show’s live stream (granted, we have no Beyoncé magic box, but we have Roman history and the literal who’s who of everything ever). While we shot, the team laughed that we should have orchestrated this during Anita Ekberg’s showstopping La Dolce Vita moment. There would have been much less than the hundreds pressing against the barricades, indignant at their lack of access to the fabled paragon. So Poseidon, I’m infinitely grateful for this heart-stopping moment to document you in all your dolphin-riding glory. I’ll be gushing about it for years (“No you don’t understand – I was in the Trevi Fountain“) . I’ll not be forgetting it in this lifetime. You, me and not another soul. But just so you know, I would mosh for you. Love the hair so much! Stunning! Your self-portraits are a delight for the eye Margaret! In Rome right now and would die to be there right now! Will be keeping my eyes out for you, Marg! these photographs are just amazing! And very classy! Your snaps from Bey’s concert was just too much. I cannot handle 2 queens in one snap. and this post. FLAWLESS. feels good to let it out now and again though, right? also, it’s amazing how you manage to shoot, edit, write and publish in such a short time. This is gorgeous! So in awe that you were able to shoot this piece on a glass runway over the fountain. I’m forever in love with the classics and Rome exudes this magnetic charm that I think you’ve really captured in the last image. These are awesome…but WHERE DID THE EXTRA LEGS COME FROM IN THAT PICTURE? Looooove the Fontana! Nie outfits for the shooting! You belong to the Fontana di Trevi, as it seems that you are part of it. You are classic, your looks and the dresses. Simply wonderful. Favourite shots of you in awhile. Beautiful writing as per usual! So incredible, and so fortunate that you could be literally in the Fontana di Trevi!! These images are simply spectacular!! What? Okay but this photo set is beyond! 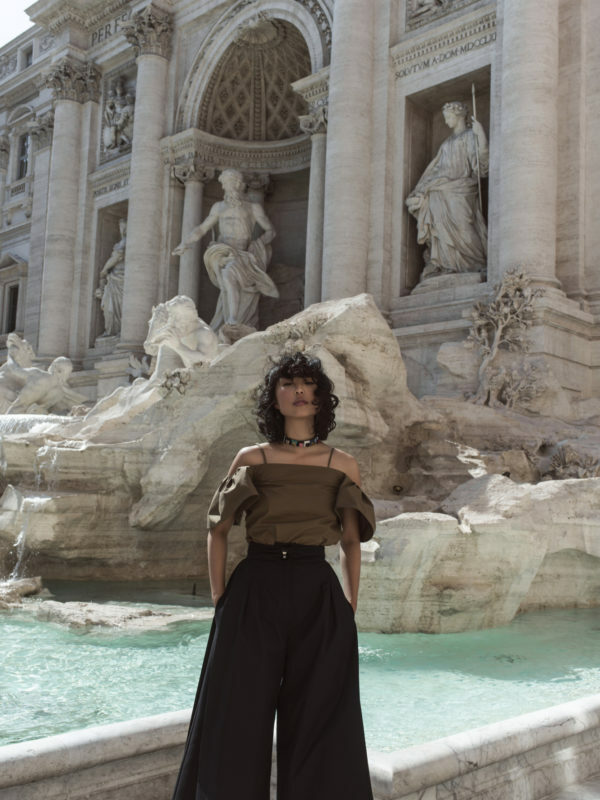 The fact that you had the opportunity to shoot at the Trevi Fountain around the time of the Fendi show is amazing! To even be in Rome is incredible so its cool that you had the chance to make some cool memories. Now for your looks, I can’t even begin to choose which one is my favorite because I love them all! I must say that off-the-shoulder top with the strap look is so dope and I can’t get enough of the color! And those flared out trousers are just on another level. I loved reading about your experience. Love! Aww such pretty self-portraits! As you may be feeling drained from your daily activities, I am actually really jealous of you. I want to live your life or just experience it. Maybe by the end of it I will be too exhausted and crying for help, but I’ll die to have such lifestyle/job/experience for once. Fashion , Art , History , Philosophy , Poetry in This Post : Congratulations !!! can you tag the clothes? they are amazing! beautiful shots,wonderful styling, I watched KONG FU Panda 2, love it. Incredibly written and amazingly photographed as usual, Margaret! beautifully written article…and the photography is out of this world. The outfits are divine..and the clothes themselves feel as timeless as this magnificent fountain. I think it happens to all of us that we close up emotionally…We need to do it at times, just to be able to survive the hustle and the pains of the daily lives. It is a wonderful thing that art exists (and artist such as Prince) who can make us whole again and help us access the most tender and valuable parts of our soul. You are gorgeous… point. At the fontana, even more! Simply amazing. What an experience this would be – one could only dream. Lovely piece of writing and beautiful photographs! Something about your words, and the message behind it, almost brought me to tears as well. I have experienced no shortage of tears in my 22 years but wow, I feel like when an artist, or a moment brings you to tears, it really is a moment you don’t forget. I am sure that the Fendi show and shooting this was one such moment – It’s been a pleasure reading and watching it along with you! great post & gorgeous photos! One of the most beautiful written posts combined with stunning photos! Loved this Margaret! I am insanely jealous of the empty Trevi (I was there last month and nearly got a concussion from the waving-around of selfie-sticks). I can only imagine how magical this must have been for you, congratulations! You deserve it pal. And, as always, I am a sucker for your linguistic flair. Margaret this made my jaw drop when I saw these pics on your Insta!!! So much love for your work girl!! Amazing! I love your writing as much as I love your photos! I continue to re-read this article and many others over and over again. There’s just something so elegant about the way every photograph and every piece of text is put together, something I will probably never achieve, but will continue to appreciate. Ah, I hate it when I’m a little behind with reading all of these posts, because there’s just so much content to absorb, it’s just brilliant. I want to retweet this. My exact thoughts. You way you write the posts is marvelous! The words are so elegant and pictures are amazing!